Spray 4- to 5-quart slow cooker with cooking spray. In cooker, mix chicken, portabella and shiitake mushrooms, shallots and garlic. Add flour, rosemary, salt and pepper; toss until chicken and vegetables are coated. Stir in broth and mustard until well mixed. Cover; cook on Low heat setting 8 to 10 hours. Stir well before serving. Portabella mushroom caps tend to be quite large, so than's why we recommend cutting them in half and then again crosswise to create bite-size pieces. To quicken prep time, look for packaged sliced mushrooms in your grocer's produce section. 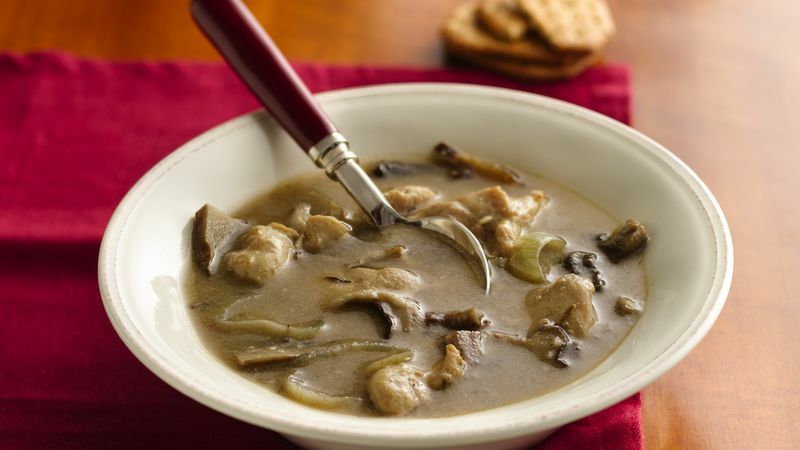 For more than 150 satisfying soup recipes, visit pillsbury.com and search for "soup."